Private and commercial Cabo real estate investment is undergoing a surge of popularity. 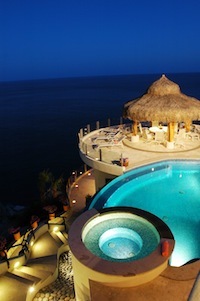 Coupled with on the spot financing available, Cabo real estate has become a high demand business venture. San Jose Del Cabo has quiet residential neighborhoods as well a high end resort developments while Cabo San Lucas boasts the private golf courses, gated communities and large private villas. Perhaps a more completely breathtaking setting for a permanent vacation, retirement, seasonal living or investment would be difficult to find. The most sought-after Cabo real estate properties and land parcels in the Baja peninsula of Mexico are located adjacent to a golf course or steps away from the ocean surf. Another popular facet of Cabo real estate are villa-style condominiums where many are included in golf club communities or strategically built to offer views of an emerald green golf course or the picturesque Baja landscape. Pueblo Bonito offers luxurious resort communities set on gorgeous real estate overlooking Mexico’s coast. Discover the luxury, beauty and warmth of Mexico at Pueblo Bonito’s exclusive estates and residential resort communities in Cabo San Lucas. Relax in private seaside villas, surrounded by miles of pristine beach, hillsides, mountains, and Jack Nicklaus designed golf courses. 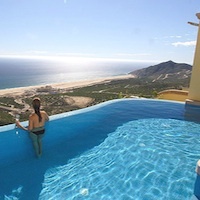 While often referred to as the Los Cabos region, take a breathtaking car ride along the coastline called the corridor from Cabo San Lucas to San Jose Del Cabo and you’ll be faced with a magnificent dilemma – a twenty mile stretch of coastal property with luxury condos, private villas and resorts or if you prefer, choice land parcels for build-out. region, with ties to the area for many years as residents themselves. There are many real estate developments in Los Cabos. It is common for resident communites to be located on golf courses or along the beach. Many real estate developmes are bullt around resorts and home ownership may include resort amenties. 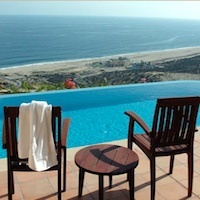 Pueblo Bonito offers stunning residences along the Pacific Coast of Cabo San Lucas. With dramatic cliff side scenery overlooking the ocean, you’ll be amazed to call paradise home. Many foreigners already live in this charming area of the Baja Sur and many more are discovering the charms of living in a climate that is unmatched in the world. Come to Cabo San Lucas and Los Cabos for a vacation…stay for a lifetime!